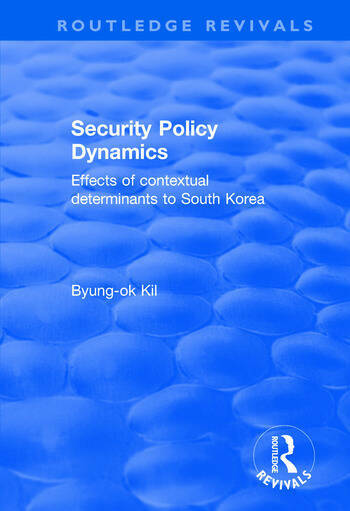 This title was first published in 2001: Byung-ok Kil's thorough analysis deals with both the broad area of public policy and the specific topic of national security policy change in Korea. Using an historical comparative approach, he tests the relative importance of international and domestic developments as determinants of security policy change. Drawing extensively on carefully selected sources of quantitative and qualitative data including original documents and interviews, this engaging text is of theoretical, methodological and applied policy relevance to the academic community and of substantive interest to a broader audience of governmental officials in national security and related policy areas. Contents: Introduction; Security policy analysis: a theoretical guide; Research design: security dimensions and contextual determinants; From anti-communism to mutual antagonism; From defensive deterrence to governed interdependence; From Nordpolitik to globalization/sunshine; Conclusion: critical factors of security policy change; Bibliography.